Bolton Priory is a ruined Augustine monastery on the banks of the River Wharfe, in the Yorkshire Dales. 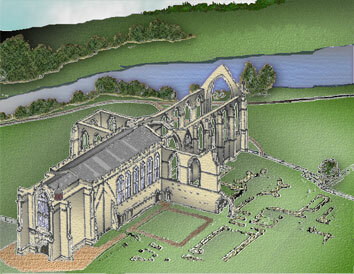 In 1520 Prior Moone commissioned the West Tower but it was never to be completed. Between 1536 and 1541 Henry VIII, with his argument with the Roman Catholic church over his divorce destroyed the entire monastery system and the work stopped. Over the years the majority of the priory was dismantled and used for building materials elsewhere in the locality although one part remains the local parish church. The base of the West Tower is incorporated into the church and so is in good order, but only a shadow of what Prior Moone had intended - it was meant to be three times higher. The base of the West Tower is the pary of the building towards the bottom left hand corner of the illustration above.